I’m sure corn must be a sacred vegetable in some part of the world or some ancient civilisation. There’s something intriguing and symbolic about those nuggets of gold nestling within the deep green leaves. And they taste good too. Best of all is corn roasted on a barbecue, lightly blackened and smoky, lavished with salted butter. There is no way to eat a corn cob delicately. You have to get to get down to it with both hands and you always end up satisfyingly messy, butter dripping onto your chin and down your forearms. Sweetcorn kernels are formidable in fritters too, making a sweet crunchy heart to the deep-fried batter. Again this is moreish unpretetentious food, something you might buy on a street stall, that demands to be eaten the moment the fritter is ready, hot and crisp, with a scoop of sour cream or a dollop of spicy tomato relish. Corn also makes the nicest soup I know. It’s not fancy or grand in any way, but it tastes earthy. Perhaps it’s because however much you blend the soup it never loses its grainy texture. Some cooks add sherry. My preference is for a couple of tablespoons of Ginger Wine (Stone’s Original), not really for the alcoholic kick but for its gentle heat, as if something warm were stroking your throat. Melt the butter with the oil over a low heat, stir in the onion and fry gently until it begins to turn translucent. Add in the garlic, the chilli and the sweet potatoes and fry over a low heat for about 15 minutes, stirring often to make sure the potatoes don’t stick nor the garlic blacken. Add the sweetcorn, sugar, miso and soya sauce, heat them through, and then pour in the stock. Bring the soup to the boil and simmer for about 20 minutes, or until the potatoes are tender. Add the milk and liquidise the soup in batches. If you are going for the ginger wine add that in now, too. Reheat. Serve with a little curve of cream on the surface of each thick and hearty bowlful, along with a sprinkling of coriander. There are winter soups and summer soups. Cold ones and hot ones. But how many soups, I ask you, are this easy to make? This tasty? This nourishing? How many are this comforting, hearty and warming-to-the-very-bones? I could go on but I’m sure you get the idea. There you are, you’ve been watching the news about all the terrible events in the world today. The attacks in Mumbai. The insurrection in Thailand. The dire state of the pound or dollar. And it’s raining outside. Not even a very interesting full-pelt kind of rain, just a dull, grey drizzle. And you think to yourself – maybe you mutter it aloud – ‘I know. I’ll make some soup’. So you wander into the kitchen and find a few leeks and few potatoes. You chop them up and add some stock. You notice it’s raining a bit harder now. And then, before you know it, something really rather remarkable happens. It happens just when you’ve ladled out a big bowlful of deep browny-green real food, and you’ve sat down in front of it in your favourite chair. It happens right then. Just this. That everything – all that stuff that stressed you so much – it all goes a little bit out of focus. Out-of-focus soup. Made just for you. Is there any better way to soothe away cares? 500g potatoes, peeled and chopped quite small. Or you could par-boil these. In a large saucepan melt the butter and fry the leeks and garlic for a couple of minutes. Add the potatoes and cook for 5-10 more minutes until the leeks are translucent and the potatoes just cooked. Pour in the stock, bring to the boil, cover and simmer for 10 minutes or so, until the vegetables are completely tender. Add the sugar and lemon juice. Blend the soup. You can do this in batches in a food processor or with a hand-held blender, as I did. Stir in the cream and add any seasoning you like. I sprinkled my soup with some chopped parsley. Relax. Enjoy. Become a blur. Having been in Cyprus so recently, there was I thinking Mediterranean vegetables and barbecues and al fresco eating, and it wasn’t until yesterday’s walk in the park that I realised I was out of sync. It wasn’t just autumn in the park, half the leaves were already on the grass. The tai chi guy was still doing his early morning stint but you wondered how long he would last. There are deer in that park and even they looked cold, their breath coming out in winter puffs of white. And so my thoughts turned to soup, naturally. On a cold day it’s soup that makes you feel human again. It’s also cheap – really a handful of carrots, an onion and some lentils, cost next to nothing. And it’s one of the easiest foods to adjust: you just throw in a few more potatoes for extra padding, or beef up the flavour with lemon juice, salt or stock. A spoonful of tahini or miso may also be a good idea, often is. So this is what I did. I fried the onion and garlic gently and just before they turned golden tossed in a couple of Thai chillies. These are those very small chillies and you need to go carefully with them. Two was an elegant sufficiency, just enough to give a comfortable glow. Then I added the chopped carrots and fried those too for a few more minutes, being a firm believer that frying anything brings out the flavour. I poured in the stock, brought the soup to the boil and then left it to simmer for about 20 minutes while I did the washing-up. It was yesterday’s washing-up actually. I hate doing it late at night. Then came my favourite bit, blending the soup. I have one of those hand-held whizzer-uppers. It used to belong to my grandmother, and it’s great for chasing after pieces of carrot. I also liked the way you could watch the whole thing turn bit by bit to a deep orange. 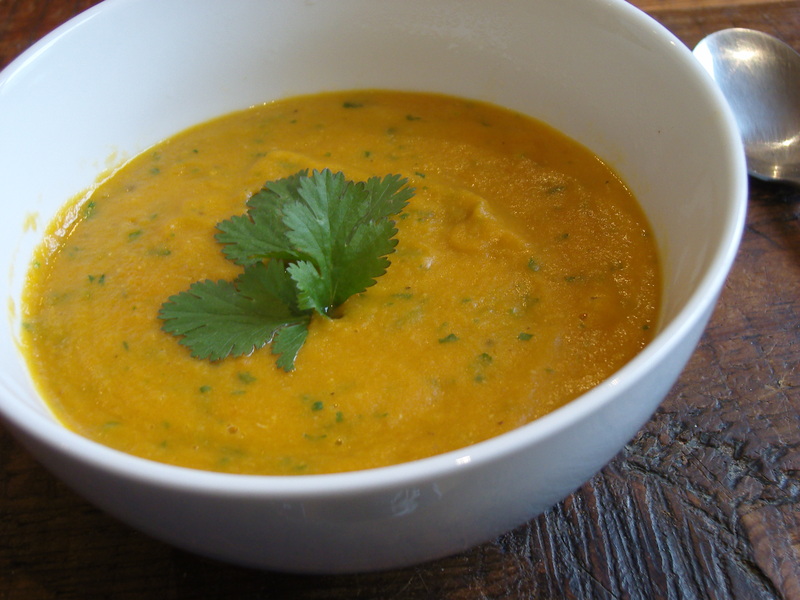 Finally the coriander went in, the soup got another blast, and the orange became flecked with green. I have to say, the soup was very good. I ate it once at lunch and then again in the evening with my flatmate D. We had a bit of baguette too (particularly crusty and fresh baguette from the Fresh and Wild store in Camden) and some basic green salad. Neither of us said very much at all, which seems to me the ultimate accolade for a meal. In a large saucepan fry the onion and garlic in the oil for a few minutes, then add in the chilli. After a few more minutes put in the carrots and when they are just beginning to turn lighter at the edges pour on the water, add the lentils, and bring the soup to the boil. Now cover the saucepan and simmer for about 20 minutes. Stir the soup every now and then to make sure it doesn’t stick. Blend it thoroughly, add the coriander and blend some more. It’s now ready to serve, with a spoonful of yoghurt if you want it. If you find the soup too thick for your taste – and it is so very creamy and thick, which I like, but then it’s your meal! – stir in more stock. I wouldn’t add cream or milk though, it’s quite full-bodied enough.